The University of West Alabama is proud to be located in the state’s culturally rich Black Belt region. Its proximity to the Black Belt gives UWA opportunities to not only study the implications of the Black Belt’s past, but to also take steps toward setting up today’s Black Belt for a successful future. One way UWA is actively seeking to energize the Black Belt is through the Black Belt Teacher Corps (BBTC), a program in which College of Education students dedicate themselves to work as teachers in Black Belt schools for at least three years in exchange for scholarships to pay for their education. In its inaugural year, UWA’s Black Belt Teacher Corps is making progress through service projects that have already left lasting effects in their respective communities. In addition to funding to pay for their own educations, students involved with the BBTC also receive funding from UWA to implement education projects in the communities where they are working. 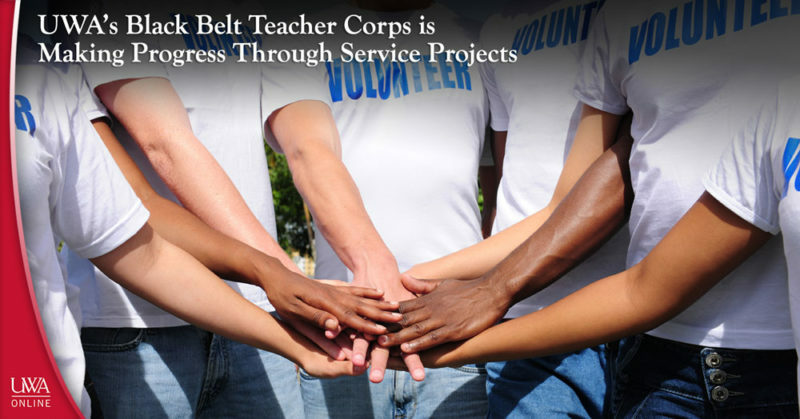 Learn more about how UWA’s Black Belt Teacher Corps is making progress through service projects. For this project, BBTC members Austin Bishop, Haley Richardson and Elizabeth Waddell transformed an underutilized room at Livingston Junior High School into a creative space available to students and teachers for collaboration, innovation and learning. Makerspaces have become a trend across the country as places to implement a variety of hands-on learning styles using everything from high-end technology to simple mind-to-mind interaction. For the project, BBTC members created a project proposal, determined a budget and acquired permission from school administrators before putting the makerspace plan into action. Championed by BBTC member Allie Marques, The Sprouting Minds Project in Demopolis was inspired by Marques’ own upbringing on a farm in Alabama. For the project, Marques worked to create accessible, raised-bed gardens at multiple schools in the Demopolis School District in order to give students the fulfilling opportunity to grow their own food from school grounds. After receiving approval from school administrators, Marques charged ahead with the project with the help of a local construction business that donated funding and installation support. Handicap-accessible raised-bed gardens have now been installed at four schools in the district and are ready for the first round of seeds to be planted. Marques said she envisions an eventual community-school partnership for community gardens or farmers markets as the gardens grow. These are only two examples of how UWA’s Black Belt Teacher Corps is making progress through service projects in its inaugural year. There are a total of 15 BBTC members currently working to implement service-based educational projects like these in the rural communities where they teach. The BBTC is a movement by the nationwide Rural Schools Collaborative to provide educational resources to schools and communities who are facing placed-based challenges common to rural areas. The program seeks to not only bolster rural communities from an educational standpoint, but also economically, and culturally. Learn more about the positive strides the BBTC and other UWA programs are making through the UWA Online Continuing Education blog! If you are interested in taking non-credit, online courses through UWA Online, visit www.uwa.edu/ce to browse our course offerings. Posted on August 20, 2017 · This entry was posted in UWA and tagged lifelong learning, Livingston, UWA Online, UWA's Black Belt Teacher Corps. Bookmark the permalink.